For the last couple of years, one of the most important columns in my TweetDeck setup was the one tasked with presenting tweets that mention Refresh Austin. The search itself is pretty straightforward, though it includes several variants to account for all of the possible ways that people might reference our group: refreshaustin OR austinrefresh OR “refresh austin” OR “austin refresh” OR @refreshaustin . This worked beautifully for a long time, but a little while back (I don’t know when exactly) I noticed that the feed included many tweets that have nothing to do with our group. A significant portion of these are written in languages other than English, so it’s been hard to detect a pattern. The photo shows five recent tweets, three of which do not apply to our group at all. The key detail is that all three link to bit.ly/ra, which I set up a long time back to point to the Refresh Austin site. But in these cases, the problem appears to be due to the fact that a longer URL, which starts with ‘ra’ was cut off when the users retweeted or simply posted a tweet greater than 140 characters. Twitter’s search now follows links within tweets to determine that they are both valid (non-spam, no malware) and also to provide additional context. 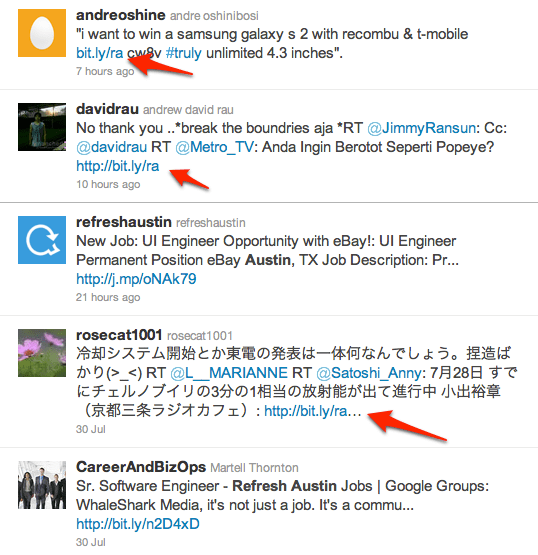 So, in this case as bit.ly/ra resolves to RefreshAustin.org, the tweets appear in my search feed even though they have absolutely nothing to do with us. So now I understand why this happens, but I do not have a solution for it. While I do not want to filter out tweets that contain the bit.ly/ra link as it is a valid link, I’d love to reduce the overall noise. This is a bit frustrating, but seems solvable with a bit of time and effort. Should I figure something out, I’ll post it. I plan to kick out the official announcement tomorrow morning, once I trust that the DNS has propagated to each little piece of the Net, so consider this a soft launch. We’ve launched a redesign for RefreshAustin.org after months of discussion, and a few stutter-steps. I won’t go into all of the details as the message I posted on the site covers a lot of it and I plan to write more about the foundation when time allows. The long and the short of it is, we have created a central location to make it easy for our members to communicate with each other, contribute to the group and access our useful resources. This is the third entry in this series, in addition to the overview, I’ve written an entry on informal meetings, covering the more relaxed gatherings that can, and should happen amongst your members between the formal meetings. One of the most important ways to maintain and expand your group is to set and stick to consistent meeting times and locations. Regular meetings ensure that everyone has a chance to plan ahead. A regular meeting time and place makes it easier for your members to arrange for babysitters, avoid making conflicting plans, and in general remember the event. It also makes life much easier for the planners, as there is time to choose a topic, presenter(s) and verify the location reservation. By planning ahead you can broadcast future topics and play up the presentations and discussions, generating excitement within your group, and hopefully driving your members to spread the word to their friends and colleagues who may not be aware of the group. Seating – remember to calculate for people bringing computers! The ideal location is one that you can use for sevaral meetings in a row. In this case laziness is a good thing. By not moving it every month or two, everyone knows where you’ll be come meeting day, so they don’t have to scramble at the last minute, looking for an old e-mail , or even worse, start on their way, realize they don’t know where the meeting is and opt to go home. It happens. It happens far too easily. While that’s a bit trite, the saying rings oh so true when you are building and planning for a group. Take a bit of time up front, and you’ll find that your group will grow much more quickly, and predictably. Keep an eye out for what works and doesn’t. If you move to a new location and see a major drop in attendance for two or three meetings in a row, step back and think about what changed, and whether you should rethink your location choice. And remember, the group should be fun for you and your members. You will have to do some work, but it pays big dividends. As always, if you have questions, suggestions or critiques, just let me know in the comments or the contact form!